A red light ahead and behind Bus 165. I cannot resist pulling out my S3 and snap this. I thought I would only see something like this in the malls. Now it is even papered on buses. May be bus stops already have them too. 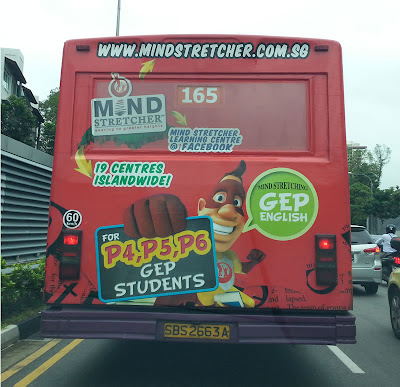 It boggles my mind why if you can get into GEP, you would need extra help. Our education system is among the best in the world could be a false claim and an empty boast if we need to put our kids on steroids of tuition to win the accolade. My kids have no tuition but they informed me almost everyone in their class get such help. As a result the younger girl often falls behind but she easily catches up with them. On the other hand my niece always had tuition even for the A levels. She went to RGS, RJC and now in Yong Loo Lin School of Medicine. My kids will never become doctors and it helps that they absolutely have no interest to.